Check out this video guide – it’s the easiest way to install presets! If you’ve never installed presets before, use this guide to get them from Preset Love into your own site. When you download a preset from Preset Love it’s going to come as a .zip file. When you download the zip file, make sure you know where it’s going. You can right click the “Download” link and choose “Save As” or “Save Target as” if you would like. When you do that, a box will pop up that lets you choose where you’re saving the file to. The desktop is a good idea, but only as a temporary storage place. On my Mac, all of my downloads just go to my Downloads folder. You can find presets to download on the All Presets or Latest Presets page. Okay, now that downloading the preset is taken care of, we need to extract the zip file. This just means that we are taking the Zip file and getting the preset file out that’s stored inside. 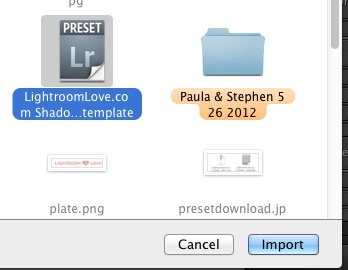 On Mac, you just double click the Zip file and the preset is placed in the same folder. On Windows, you’re just going to right click the file and click Extract All. Choose where you want the zip to be extracted – to doesn’t matter which one – just remember where! The Desktop is a good place. The preset comes as a Zip file, and then extracting it reveals the preset inside! The preset is now extracted! You’ll see a new file that ends in .lrtemplate in the folder. Now, we’re ready to go to Lightroom and get the preset into the program. Go ahead and open Lightroom and enter the Develop module. We will now to import the preset into Lightroom. Take a look on the right side in the Preset panel. You’ll see lots of presets built into Lightroom, and now you’ll want to add your own. Right click (command + click on the Mac) to the left of the preset names and choose Import. 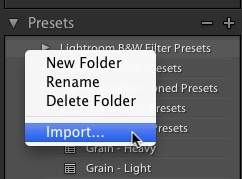 Now, Lightroom is going to have us browse to where our preset is stored. Click it and choose “Import” to add it to Lightroom. If we have multiple presets, you can select all, or shift click to select a list. After that, you’ll find the preset available for use in the Preset panel, probably in the “User Presets” folder. Getting presets loaded into Lightroom takes just a few easy steps. Let me know if you need more help with a comment! I’m having the same issue on my laptop with Windows 10….I’m in Lightroom and its not doing anything when I right click ANYWHERE . What’s the trick with getting these imported ? Help ! I’m sorry, I’m not clear – can you be a bit more specific with when and how you’re seeing the issue? Please retry following the YouTube video at the top of this tutorial. Most of these downloaded just fine–thanks for the help! However, there are a few presets that cannot be loaded into LR; I get an error message saying it’s “the wrong type of preset.” I’ve deleted & re-installed those presets. Any other suggestions? The presets were the “Roz” and “Background Blur” ones. Thanks!